SafeBrands provides a high quality service with proactive and skilled teams, support staff to assist when needed, and the ability to provide you with the best advice for even the most specific configuration requests. Using a private rack gives you the freedom to house the hardware of your choice, including rackable servers, towers, firewalls etc. In order to maintain our network security, our technical team requires the use of APC masterswitches and Cisco switches (ref. 2960). Our ‘Select Certified Partner’ status provides you with a 50% discount on this equipment. Although our services include bandwidth of 10 Mbps for your initial operating requirements, SafeBrands gives you the freedom to choose your telecomms operator in a completely transparent and independent manner. Our technical team prides itself on the quality of the equipment that we provide. 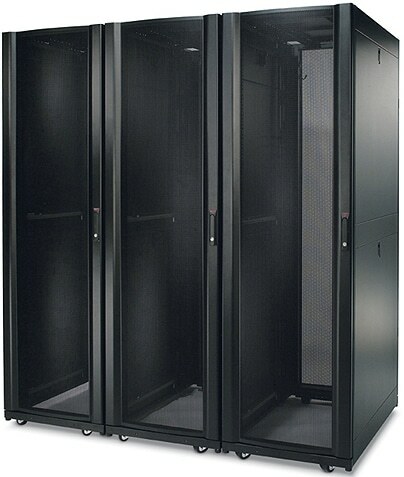 The APC racks are a standard 42 U format, and are compatible with long-frame units (600 x 1000) and with 19’’ modules. All of our rack rental contracts include bandwidth of 10 Mbps by default, and burstable bandwidth of up to 100 Mbps. Our advisors are available at any time to guide you towards the most suitable solution. They can also offer you personalized configurations to match your needs perfectly.